The Cairns Foundation was established in 2003 by James L. Cairns. The Cairns Foundation's mission is to identify creative students with entrepreneurial potential, then for their own benefit and for that of the community, to mentor and financially help them achieve technical and commercial success. To fulfill its mission the Foundation co-sponsors an annual Innovation Challenge wherein students from local colleges and universities pitch their ideas to a group of potential investors and compete for cash prizes and ongoing business-incubator support. It's a winning experience for the community and all those who participate, not only those who take away prizes. Additionally, Cairns Foundation members mentor inventors of all ages. 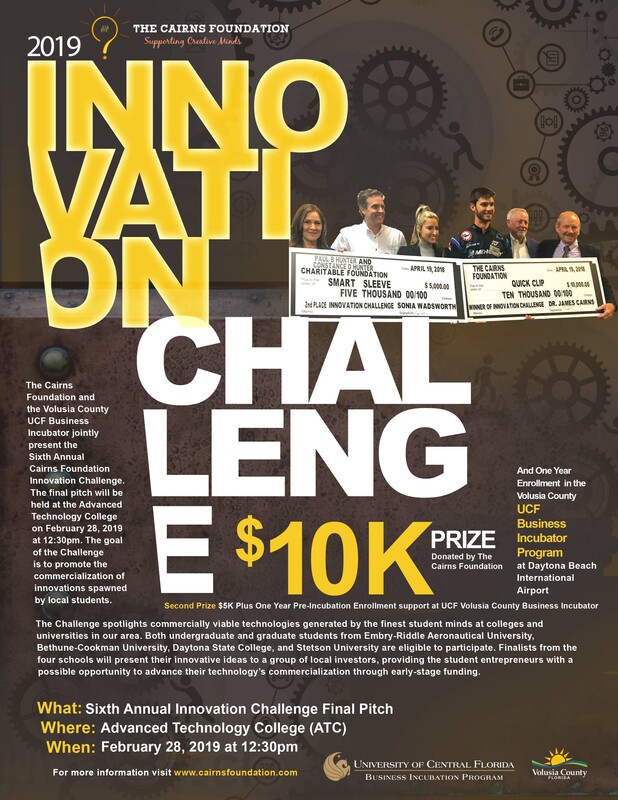 Please click on the INNOVATION CHALLENGE tab for more details and application requirements. Final pitch event on February 28, 2019 by invitation only. Finalists from the four schools will present their innovative ideas to a group of local investors, providing the student entrepreneurs with a possible opportunity to advance their technology's commercialization through early-stage funding.